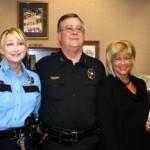 CONROE – In a Tuesday afternoon ceremony attended by colleagues, family and friends, Conroe Police Lt. Russell Reynolds was officially promoted to Deputy Chief of Police. 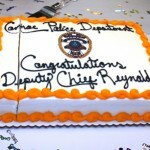 Deputy Chief Reynolds began his career with CPD in 1978, was promoted to sergeant in 1984 and to lieutenant in 1990. 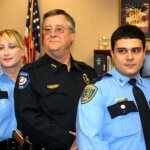 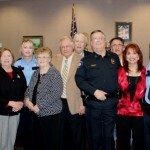 Chief Phillip Dupuis received approval last month from Conroe City Council to hire a second deputy chief after an FBI Law Enforcement Executive Development Association study determined the position was needed. 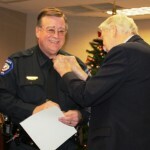 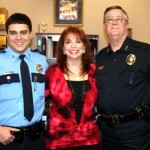 Chief Charlie Ray retired earlier this year and in October, Dupuis was given the top spot. 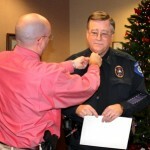 He named Lt. Mike Hansen as his replacement as deputy chief soon after and then requested the second deputy chief position, now filled by Reynolds.